There are times when you just have to try something for no reason other than that it would be fun to see how it turns out. 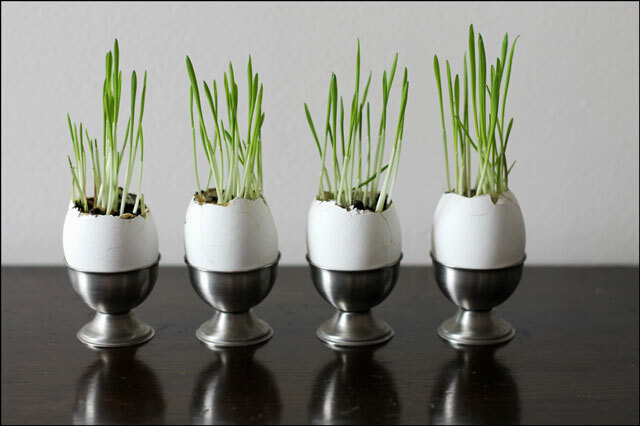 This was the case recently, when I boiled some eggs for egg salad sandwiches, and preserved the shells intact, so they could be used as little planters. I cut the tops of as carefully as I could (although they still turned out jagged and a little cracked around the edge) and scooped the egg out using a tiny spoon. 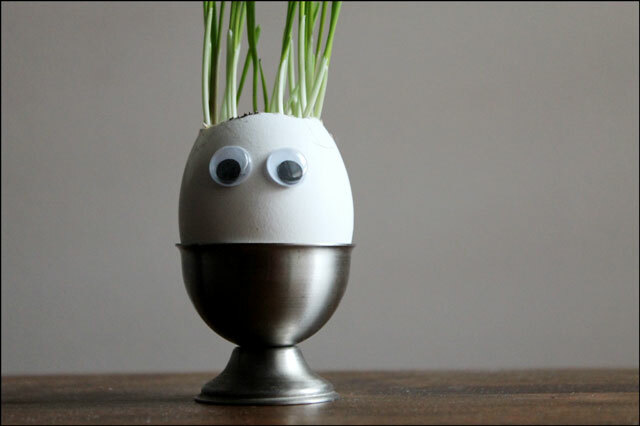 Then I poked a drainage hole in the bottom of each one with a pushpin, and placed them back into the egg carton. 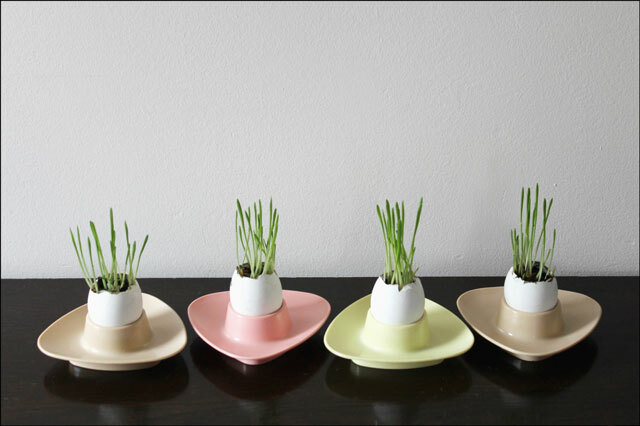 I filled each shell with a bit of regular potting soil and then dropped in some wheat grass seeds (aka cat grass). I pushed the seeds down a little with my finger but didn't completely bury them, and watered them well. Then I placed the carton on a tray (because water can leak through the egg carton) near a window but in indirect sunlight. 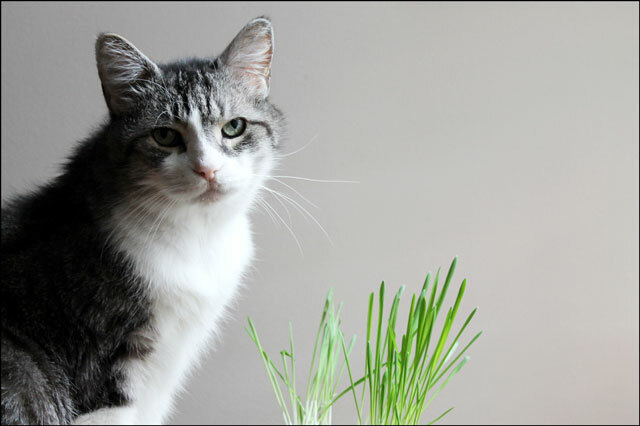 It took exactly one week for the seeds to germinate and the grass to grow to the length in these first pictures (before the cat entered the scene). You might not think it is working at first because the seeds just seem to sit there for the longest time, and then suddenly you'll notice little green spikes coming up. I checked them everyday to make sure the soil was moist throughout and watered a bit when it felt dry. Once the grass begins to grow, it does so quite quickly. If it gets too long, just snip the ends with regular scissors. 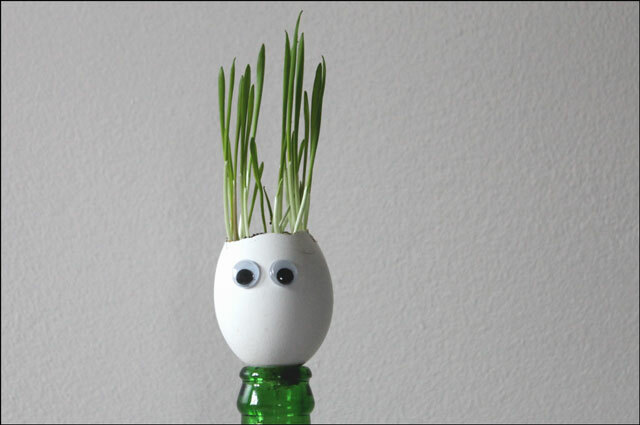 Kept trimmed, you grass eggshells should last about 5 days. 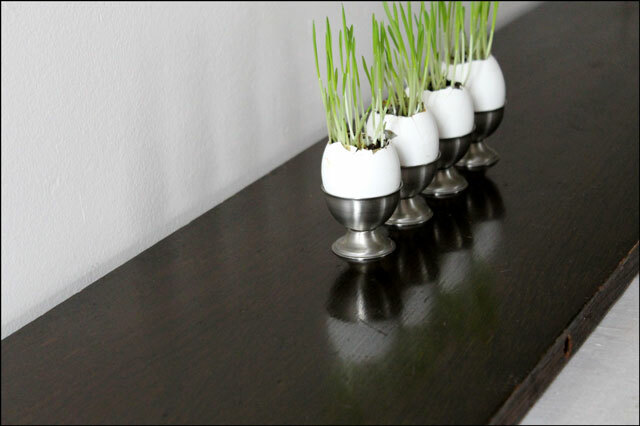 And of course, being egg related, if we'd had guests over for Easter dinner, these would add an interesting element to a centerpiece display on the table. If you start them about 9 days before they should be ready to display when you need them. 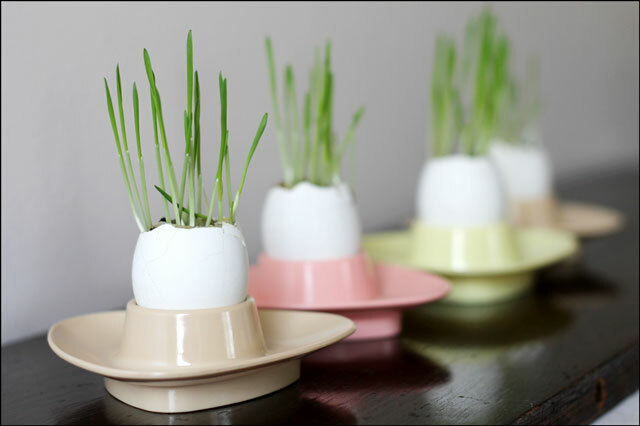 Put them in some cute eggcups or if you want to display them in an egg carton use a fresh one, as the one used for growing the grass will probably be a bit dirty or worn looking. 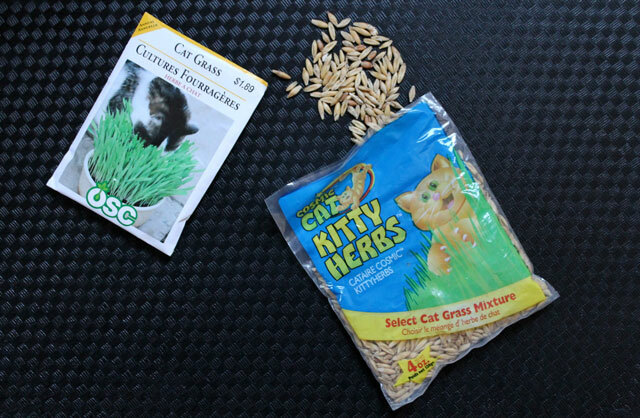 The grass is 'Cat Grass' and is grown from seeds we got at the pet supply store. I have also found the seeds at garden centres. And since this kind of grass is specifically for cats to eat, I let Eddie have a go. He loves the stuff and I keep two pots of it growing in rotation for him during the wintertime, when he can't find grass outside. To give you a feel for how quickly it gets growing once it starts, these pictures with Ed were taken a couple of days later. The grass grew more than an inch every 24 hours. Doesn't he look like a raccoon in this first shot? PS. I needed some instructions on how to hard-boil eggs without cracking the shells so perhaps you do too. Nick gave me some tips: Bring the water to a boil before carefully putting the eggs in. Use a slotted spoon, bob each egg in and out of the boiling water a few times, in order to get the egg used to the hot water. Then gently lower the egg into the water. Set your timer and boil for exactly 12 minutes. Remove from heat and run cold water over the cooked eggs. Perfect every time, or so I hear. It worked for me -- I'm pretty sure this was the first time I've ever boiled eggs without having half of them cracked and escaping from their shells as they cooked. I don’t think I could ever be over-catted! :o) I love the colour of the fresh green grass. 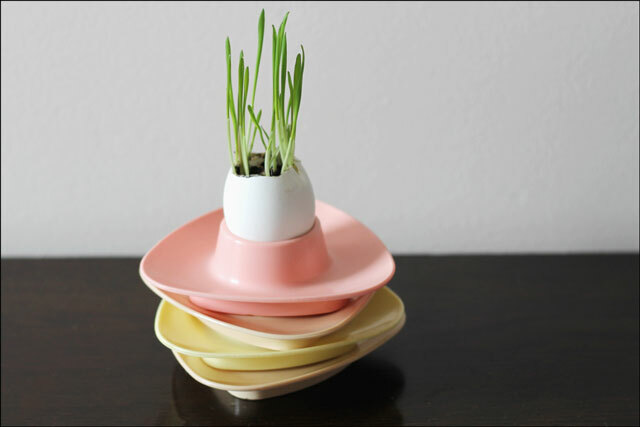 And your egg cups are gorgeous. These look like shots from a fancy magazine! P.S. : Does Nick have any tips on perfecr soft-boiled eggs? I always end up with a little bit of gooey egg white. Ugh! Hi Annika! I asked Nick about soft-boiled eggs and he suggested probably using the same method, but cooking for about nine minutes, and then removing them from the water right away so they stop cooking. 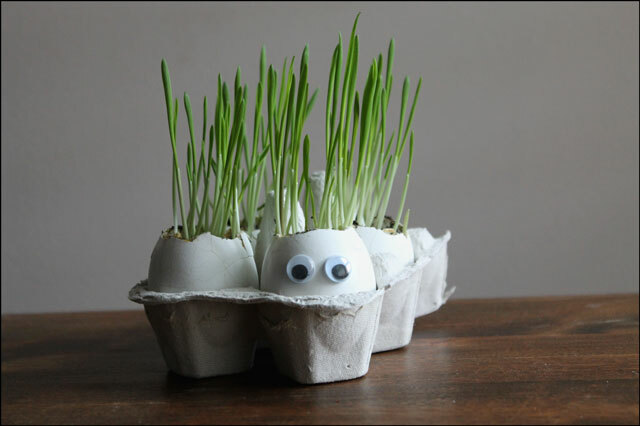 Hi Marisa :) The grass has been growing in the egg-shells for almost 2 weeks now, and although there are some roots coming through the hole I made in the bottom of them for drainage, they are holding up will. I imagine if I had put a small plant that didn’t grow as quickly as the grass does, that they’d last quite a while. 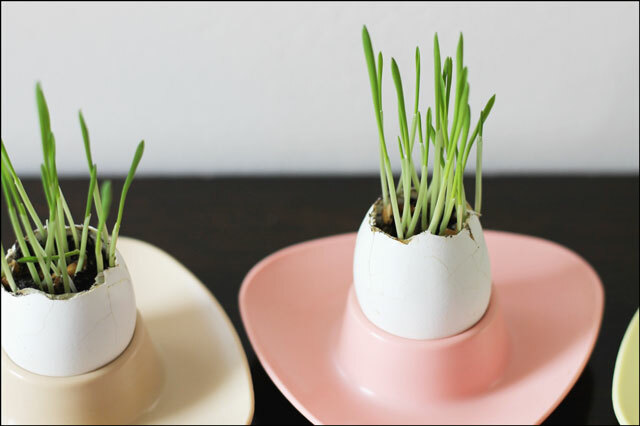 This method would also be perfect for starting seeds to be put into the garden once things warm up, as you could just plant the whole thing, shell and all. Awe Vix. I know very well that he would adore you if he were to meet you too! Aww Vix. I know very well that he would adore you if he were to meet you too! First of all, there can never be too many cat pictures :) Secondly- these are SO flippin’ cute!! I really want to make some for my cats to nibble on, and that’s awesome they grow so fast. I love this idea! Thanks Lisa! I usually grow Eddie’s cat grass in a larger planter but I prefer these smaller portions for him, as the ones he has chewed down can be put aside and allowed to recover a bit, whereas, with the large planter, it just looked like a mess after he’d been at it. Oh my these are so cute and awesome! Love them. 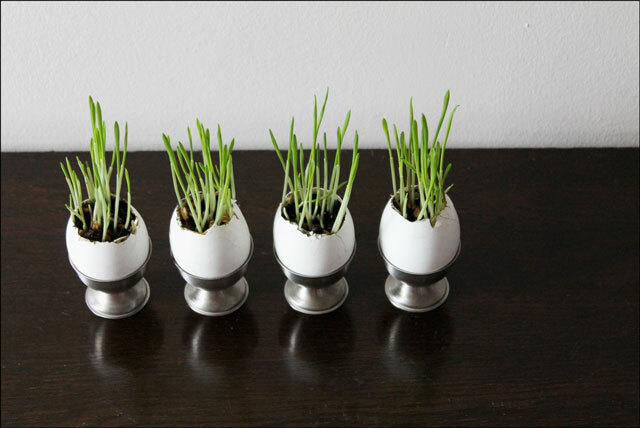 I once saw a pictures of plants in eggshells and wanted to try for myself too but never did. This makes me want to again. They goggly eyes addition is also simply perfect! oh you know i wouldn’t mind if you over catted us to death haha. and anyway, i’m so impressed w/ this!! i can never boil an egg right like that, let alone cut it. this is such a cute idea i think i’ll feature it if u dont mind. did you eat the grass like the grass shots in smoothie places? love seeing kitty have a taste too haha. Hi Dus :) Thank you. 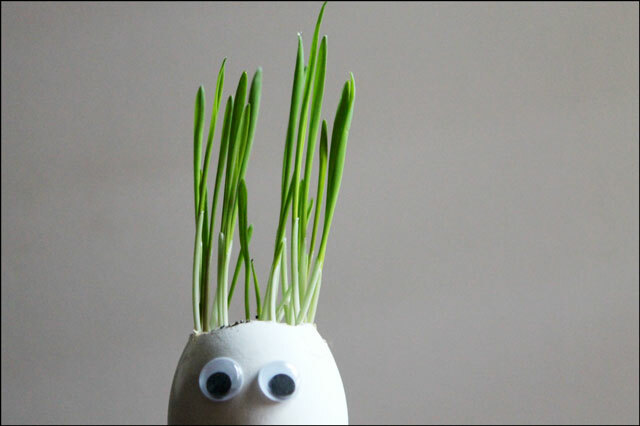 By all means, feature my grass eggs if you’d like. 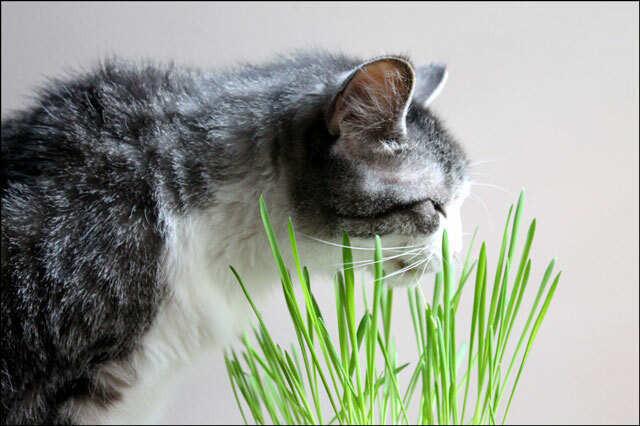 The grass is wheat grass so I suppose we could eat it, however it is Eddie the cat who has been enjoying it. 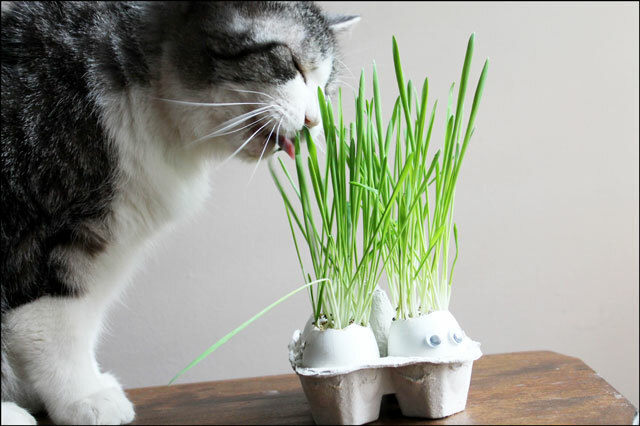 I would love to feature a photo of your Ed munching on his cat grass in one of our newsletters if that’s okay? Such a great shot! Hi Renee. Thank you! 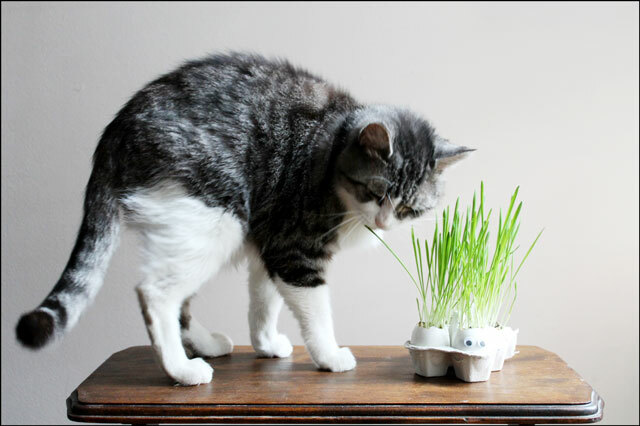 Certainly you can pu a picture of Ed eating cat grass in your newsletter.